A year ago right now Becky and I were in Ireland. We have had many great trips together but this one was just magical. I’ve written many times about how amazing the Emerald Isle is, some may even think its almost an obsession. It is a place that we plan on visiting again and again. We flew from Chicago to Dublin, leaving on May 4 and arriving the morning of May 5. Ireland is five hours ahead of Michigan and six hours ahead of Chicago. Our first day was spent in a sleepy haze, but we managed to make the two hour drive from Dublin to Galway, spending a good part of the rest of the day sleeping and adjusting to the time change. May 6: We drove from Galway to Clifden, along the coast of Galway Bay. 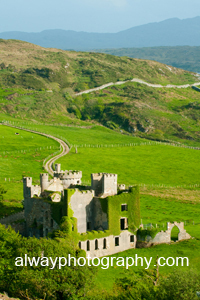 That afternoon we found Clifden Castle and created the above image. 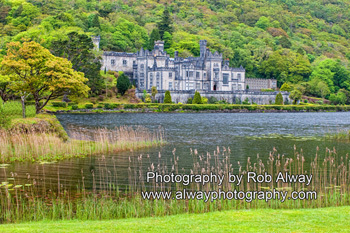 May 7: A year ago today we drove from Clifden to Achill Island, stopping along the way at Kylemore Abbey (below).